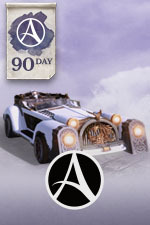 Run wild over the Western Hiram Mountains with a new, supercharged car and a whole host of helpful boosts and bonuses. Get account-wide access to tons of awesome benefits, including increased Labor gains, bonus experience, the ability to own land & more. Purchase incredible items – including mounts, pets, costumes & more – from the ArcheAge in-game marketplace. 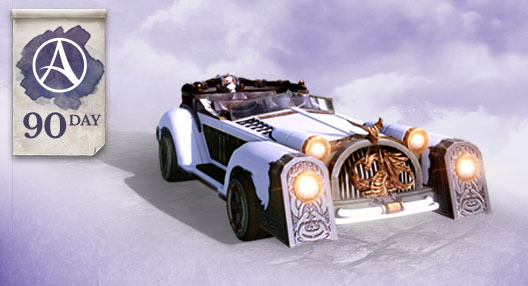 Speed across Erenor in this color customizable vehicle! Take your gear to the next level by upgrading your Superior Red Regrade Charm into a Silver Regrade Charm. Boost your chance to improve your gear through tempering. Awaken your Hiram Guardian gear and unlock higher item grades and synthesis effects. Enhance your costumes or undergarments by rerolling one of their stats. Improve your Hiram Guardian gear through the power of synthesis. Keep your property by using these to pay to maintain your houses, gardens, and farms. This is an Internet-only game which requires players to connect to Trion servers via their own Internet connections. Players are responsible for their own Internet connection service and all Internet-related fees. Trion Worlds does not ensure continuous or error-free access, use, or availability of any game content, feature, gameplay, or server and may change, modify, disable, suspend, or remove any such content, feature, gameplay, or server at its sole discretion.